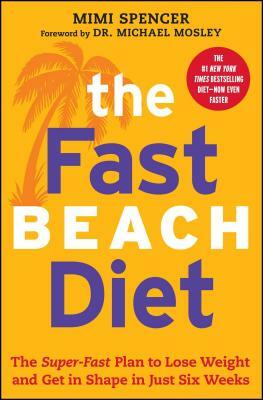 With a foreword by Dr. Michael Mosley, this is FastDiet 2.0, a complete diet and exercise plan designed to help you get your ideal beach body in just six weeks! In the #1 New York Times bestseller The FastDiet, Michael Mosley shared his groundbreaking 5:2 plan—eating normally five days a week, fasting for two, and becoming slimmer and healthier as a result. Now, with The FastBeach Diet, a modified, high-intensity version of this plan, Mimi Spencer will help you get beach-fit in no time! With a full-color, week-by-week planner to keep you on track, this speedy diet plan won’t let you down. Watch the pounds fly off as this no-fuss exercise and diet program gets you ready to hit the beach—the Fast way. Mimi Spencer is a feature writer, columnist, and the author of 101 Things to Do Before You Diet. Dr. Michael Mosley is the #1 New York Times bestselling author of The FastDiet, FastExercise, FastLife, and The 8-Week Blood Sugar Diet, and The Clever Gut Diet. Dr. Mosley trained to be a doctor at the Royal Free Hospital in London before joining the BBC, where he spent three decades as a science journalist and executive producer. Now freelance, he is a well-known television personality and has won numerous television awards, including an RTS (Royal Television Award), and was named Medical Journalist of the Year by the British Medical Association.